Seahorse is a small familyhotel/bed and breakfast with four double rooms directly on the beach promenade. 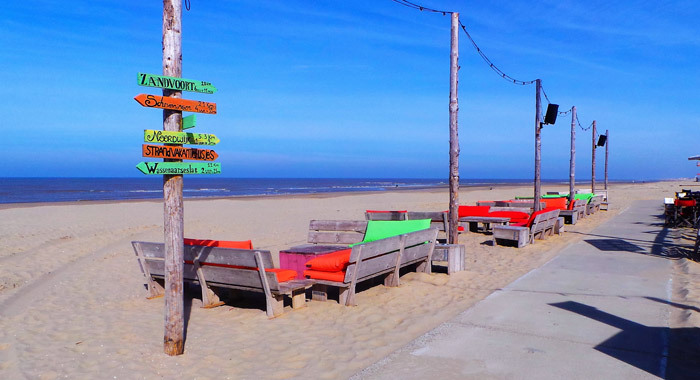 Katwijk has a lovely extensive sandy beach where you can enjoy your summer holiday, sunbathing and swimming. Besides summertime it is the ideal starting point for bicycle tours to Noordwijk or Scheveningen in autumn/winter. Walking along the shoreline or through dunes, spending a lazy day on one of the many terrasses. Visit a nearby city like Leiden, The Hague, Haarlem or Amsterdam. Shopping you can perfectly do in Katwijk, you will find a great variety of shops here. In spring you can visit the beautiful garden Keukenhof and have a look at the famous tulips, hyacinths, perhaps make a tour through the bulb fields. In Seahorse you can enjoy every season from the beach experience. Breakfast with sea view. Rooms at the promenade side have wonderful overview at sea, dunes and beach. Seahorse has four double rooms and a summerhouse/appartment. Rooms have facilities or the use of shared facilities. All rooms have flatscreen-tv with hdmi-connection and free wifi. Breakfast room is always open to our guests. Tourist tax 2019 € 1,50 p.p.p.n. Parking in garage (3 min) € 1,70 p.s.